Wow! What weather we have been having this past week! We will have quite a few vendors at the market this Saturday – a returning vendor, Gilbert Gasper, “The Tortilla Man”, and a new vendor, Sierra Fox, with her “Chic Gypsy Café” beverage cart. 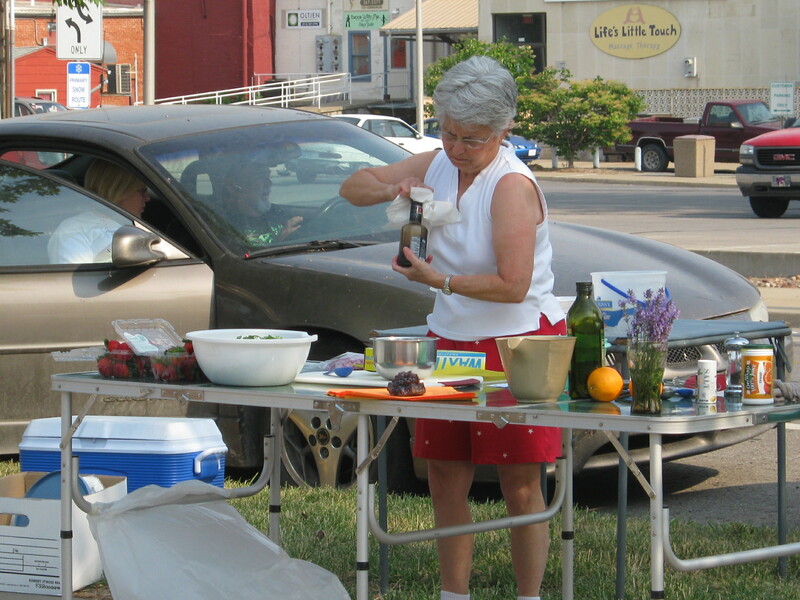 In addition to fresh local produce, we will have two community groups at the market. The Juneteenth committee will be at the market again to let everyone know about the celebration and to sell t-shirts as a fundraiser. New to the market will be the Atchison Art Association. Between 8 and 10:30 a.m., they will be selling biscuits and gravy as a fundraiser. But, more fun, they will be doing “bubble art”. Bring your children to participate in this art event. The Atchison Art Association will be coming on the first Saturday of the month all summer! This is also the day for our first Saturday Bundle Give-Away. That will take place around 10 a.m. Don’t forget to register for the July Bundle Give-Away at Lyn Hoffman’s stand. Seasonal reminder: Saturday is our main market day. Vendors who have sufficient produce also come for the Wednesday market day. As the summer progresses, more vendors will be at both market days. Organically grown produce, bedding plants, and free range brown eggs. Spinach, lettuce, radishes, onions, eggs, and possibly strawberries. Elias Honey (Chuck Elias) He will not be at the market this Saturday as he is going to a honey producers meeting, but his honey products will be available from the Long View Farm stand (honey, baby honey bears, and honey straws). He will return next Saturday. Emilie Koehn – The Pie Lady She will not be at the market this Saturday, but will be back next week. Green onions, radishes, and spinach. Arugula, asparagus, bok choi, fresh brown eggs, collard greens, green onions, fresh herbs (a variety), leaf lettuces, kale, radishes, rhubarb, swiss chard, blackberry rhubarb jam, almon biscotti, and fresh flowers. Artisan breads, fresh brown eggs, goat milk soap and lotion, and snow cones. Wash, trim and dry spinach, and, if necessary, crisp in the refrigerator. Mash garlic and salt together. Stir in the mustard and lemon juice and gradually beat in the oil. Pour dressing over spinach and toss well. Serves 4. For a main course, add 6 slices crumbled cooked bacon, ¼ c. freshly grated Parmesan cheese, and 2 finely chopped hard-boiled eggs. Crops are still being planted, due to the late Spring weather. You can pick up some bedding plants at the market from our local growers. Come to the market for your middle of the week produce shopping. But don’t forget the Saturday market. We will have several community events going on this Saturday. The folks from Juneteenth again promoting the celebration coming up in a couple of weeks; the Atchison Art Association will have a biscuit and gravy fundraiser and their youth group will do a “bubble art” project with children; and perhaps some musicians. Other vendors may be present. Isn’t the weather wonderful for sleeping? Spring vegetables are doing great: asparagus, rhubarb, lettuces, radishes, scallions, and so much more. But summer vegetables could use a bit more heat! We will have the Juneteenth group with us this weekend. They will be selling t-shirts to raise money for the event and giving our information about the festivities. Check their table to learn more about this important commemoration. Did you know that you can make a delicious summer drink using rhubarb? Serve it over shaved or crushed ice. 1 Combine rhubarb and 1 cup water in a small non-reactive saucepan. 2 Bring to a boil over high heat. 3 Reduce heat to low, cover, and simmer 20 minutes. 5 Measure the juice and add enough water to make 2 cups. 8 Bring to a boil over medium heat, stirring until sugar dissolves. 9 Increase heat to high and boil briskly, uncovered and undisturbed, for 5 minutes, or until syrup reaches 220°F on a candy thermometer. 10 Cool to room temperature. 11 To serve, pour 1/2 cup syrup into a tumbler. 12 Stir in 1/2 cup cold water. 13 Fill tumbler with crushed or shaved ice. On Wednesday, May 22, there will be at least three vendors at the market between 2:30 and 5:30 p.m. Monie from L & R Farms will have asparagus, spinach, green onions, radishes, potatoes, bedding plants (strawberry baskets, annual flowers, tomatoes, and pepper plants). Chuck Elias, a new vendor this season, will have local honey, including mini-honey bears, and honey sticks. Sierra Fox will be at the market with gourmet coffees. Come pick up your mid-week needs this Wednesday. Janean Bowen demonstrates a food recipe. The 2013 Atchison Farmers Market is here. Stop by and see us on Wednesday from 2:30 – 5:30 between 6th and 5th on Main Street in downtown Atchison and on Saturday from 8:00 – Noon.